Direct and Private (NOT shared) Fiumicino airport shuttle and taxi transfers services. The best way to reach your destination. All our Fiumicino airport transfers are door-to-door, private and direct. Fiumicino airport meeting point: your driver will be waiting for you at the airport arrivals lounge, with a sign showing your name. When booking an airport transfer, the main selection criterion of most people is reliability. 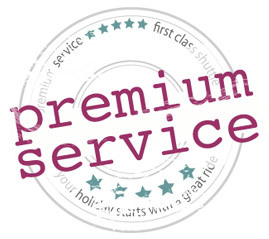 By choosing us, you will be in safe hands, since we only work with professional and experienced drivers. Our customer service manager, Mr. Pietro, will monitor your flight arrival time. 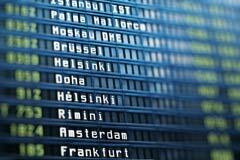 If your flight is in delay, your reservation will be automatically updated and the driver will be at the meeting point at the actual arrival time of your flight. NO RISKS! Our Fiumicino airport shuttle prices are fixed and guaranteed, without hidden charges, regardless of the actual time needed to get to your destination. If the transfer takes more time because of traffic, closed roads, bad weather or other unforeseen circumstances, you will not pay more. All our vehicles are licensed and fully insured. They range from luxury Mercedes S and E class limousine, to minivans and vans, to saloons (sedan), to estate car (station wagons) and People Carriers (Mini Vans MPV's). Mini Buses and buses for groups up to 56 passengers are also available for almost all destinations. Child seats are available upon request with no additional cost. Reservation is fast, easy and SECURE with us. 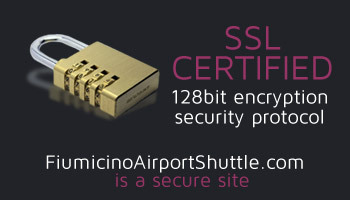 We use the SSL technology, that encrypts all data before sending them to our secure server. In only two steps your Fiumicino airport shuttle and taxi transfer will be booked. Our Customer Service is available 24 hours a day, seven days a week to follow you before, during and after your trip.